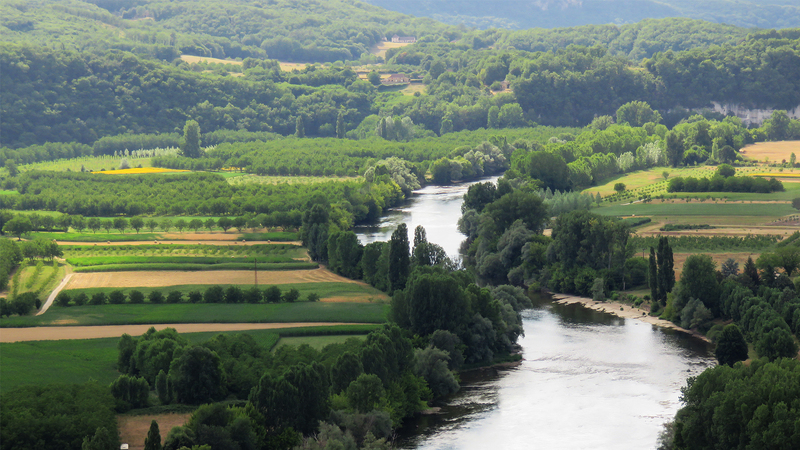 On a bright May morning, so early that the last of the mist was still lingering low over a bend in the Vézère River, a white van drew to a halt on the ridge that overlooked the small French town. A man climbed out, strode to the edge of the road and stretched mightily as he admired the familiar view of St. Denis. The town emerged from the lush green of the trees and meadows like a tumbled heap of treasure; the golden stone of the buildings, the ruby red tiles of the rooftops and the silver curve of the river running through it. The houses clustered down the slope and around the main square of the Hôtel de Ville where the council chamber, its Mairie [mayor’s office], and the office of the town’s own policeman perched above the thick stone columns that framed the covered market. The grime of three centuries only lately scrubbed away, its honey-colored stone glowed richly in the morning sun. On the far side of the square stood the venerable church, its thick walls and squat tower a reminder of the ages past when churches, too, were part of the town’s defenses, guarding the river crossing and the approach to the great stone bridge. A great “N” carved into the rock above the central of the three arches asserted that the bridge had been rebuilt on the orders of Napoleon himself. This did not greatly impress the town’s inhabitants, who knew that the upstart emperor had but restored a bridge their ancestors had first built five centuries earlier. And now it had been established that the first bridge over their river dated from Roman times. Across the river stretched the new part of town, the Crédit Agricole bank and its parking lot, the supermarket ad the rugby stadium discreetly shaded by tall oaks and think belts of walnut trees. But alas, as so often happens, there is a serpent dwelling in this Eden, a serpent that periodically bares its fangs. When an elderly man living alone is brutally killed, it’s up to Bruno to solve the terrible crime.The deeper the investigation goes, the more apparent it becomes that the root cause of this murder lies buried in the old man’s past – in fact, in France’s past. Surely one of the major attractions of this novel and succeeding ones is the character of Bruno himself. He is not only a skilled and conscientious policeman, but he’s also deeply embedded in the town’s social and political life. It’s easy to believe in his affection for his fellow citizens of St. Denis; it’s bodied forth in everything he says and does with regard to them. And then there’s his love life…. 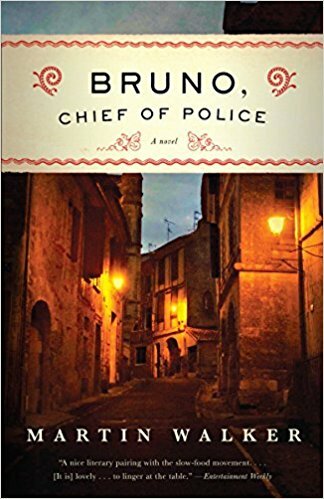 In Bruno, Chief of Police, we become acquainted with, among others, Pamela, a relocated Scotswoman who’s become an innkeeper, and Isabelle, a rising star in French law enforcement. Bruno is attracted to both women. What will ultimately come of this attraction is anyone’s guess, but I can tell you that they both appear in subsequent entries in the series. As Bruno fed his chickens, he pondered what to wear fro dinner that evening. If you follow this series, you’ll find that the present in St. Denis is often shadowed by the events of the Second World War. There were some heroes, to be sure, but there were also some who sought the coward’s way of survival. There were even traitors. There are moments when the past simply refuses to stay buried; when this happens, sometimes crime results, and pain comes along with it. This happens in Bruno, Chief of Police. And yet, the beauty of the present day can still be celebrated by good and decent people whom it’s a pleasure to know. Chief among them is Bruno Courrèges. For whatever reason, our discussion ranged far and wide, often straying from the book itself. We never worry too much about that; we return to the matter at hand, eventually. Our surroundings at Hilda’s house were gracious and comfortable – thanks, Hilda! – and Cookie, the resident canine, was uniformly affectionate and companionable. All the Bruno books are indebted to my friends and neighbors in the Périgord and the lovely landscape they nurture. It has fertile soil, wonderful food, excellent wines, a temperate climate and more history packed into its borders than anywhere else on earth. It is a very special place, filled with enchantments. It’s been a pleasure, but I must fly: A Taste for Vengeance (2018) is waiting on my night table. One of my all-time favorites on so many levels! I think I’ve read it three times! 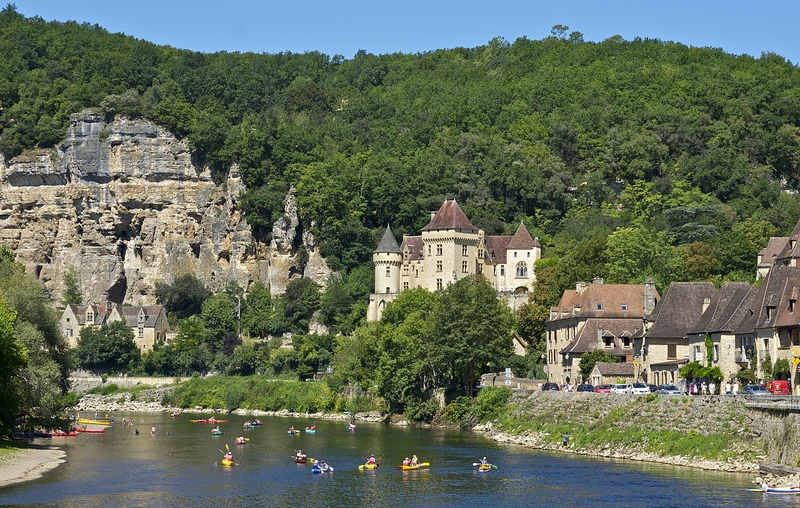 We were lucky enough to visit the Dordogne on a Road Scholar tour. It was just as beautiful as we expected–but Bruno was nowhere to be found alas! I’ve read all the Bruno novels but was unaware of The Black House, so thanks for bringing it to my attention, Roberta.